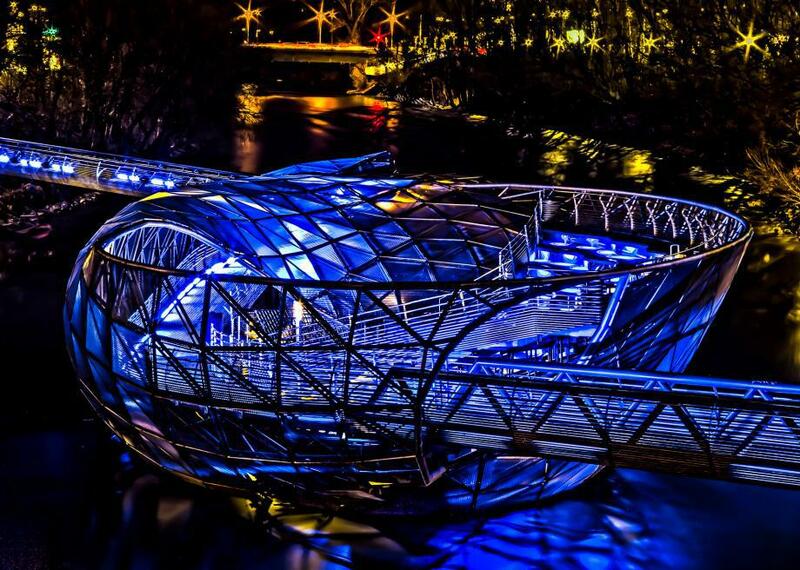 Austria's Murinsel Bridge is a stylish span that helps pedestrians cross in style. A bridge with unforgettable style. When Graz, Austria, was appointed as the 2003 European City of Culture, it got a futuristic alien heart of a museum, but that’s not all; the city also became home to this space-age bridge-island hybrid. Called the Murinsel (German for Mur Island), the glass and steel creation is not exactly a free-floating entity, but it’s about as close as you can get for a big metal bowl covered in neon lights. The arty island was the creation of American artist Vito Acconci, who wanted the ultra-modern construction to evoke a giant sea shell. Thus the main portion of the construction is a swerving, curving bowl shape with seats around the inner rim and paths and tunnels that weave around the main body, connecting to the two foot bridges that connect to either bank of the Mur River below. Inside of the rippling domed interior of the Murinsel’s body is an amphitheater, a café, and a playground, making it maybe the most jam-packed island around, in terms of entertainment per square foot. The Murinsel is an impressive sight in the daytime, but it really shines when the sun goes down. The entire steel shell is laced with deep blue lights that come alive at night, making the artificial island seem all the more alien. As one of the most out of this world bridges (or islands), the Murinsel is far more than just a way to get from one side of the river to another. It is a real-world science-fiction destination in and of itself.